With this month's newsletter we want to introduce a new structure of articles. There are three main parts. The first part will take care of Tango dancing in general. This includes local Tango events as our weekly Práctica as well as international Tango events and DJ-ing schedule. The second part is about Tango CDs. Especially it will include CD-reviews of albums which became available in our TANGO-DJ.AT/shop, or elsewhere. This will also be the place where we will mention "out-of-print" CDs we are able to offer. 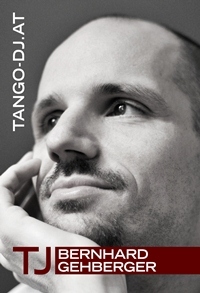 The third part will cover most important changes to our TANGO-DJ.AT Tango database. We will introduce the most important albums having been added as well as major updates of existing entries. We do hope you find this structure helpfull to follow our activities and find what you are most interested in easily. In this section we are going to introduce CD-reviews, new releases, or "out-of-print" CDs we were able to get hold of and offer on TANGO-DJ.AT/Shop. Please mind also that we are adding several CDs of various labels for one time sale at the moment. We strongly recommend that you stop by now and then in case there is something you have been looking for quite some time and which is for sale now. Almost all of them are from Buenos Aires and cover traditional Tango, but there is also a selection of Tango Nuevo albums. You won't be able to find plenty of them anywhere outside of Buenos Aires, so check them out in time. Being a recipient of our newsletter you are the first being informed about CDs of special interest before they get available in the shop. We were able to get hold of the following AMP and CTA CDs being "out-of-print". They will get available in the TANGO-DJ.AT/Shop over the weekend. In case you are interested try to be quick as there is only one copy each! You may also consider to go for some of the "regular" AMP or CTA CDs as along as they are still available and on offer for reasonable prices as the latest CTA CDs for 39,- EUR! If we managed to get you curious, please get your copy from TANGO-DJ.AT/shop where it is on sale now. As always you may take a look at the extensive booklet we offer as high res scan for your convenience. But it is a very nice compilation of argentine Zambas indeed. Especially because it is actually available. You may order and read more about it on Michael Lavocah's blog. This section will cover the most important latest updates of the Tango database. This is about the information only. Most of the CDs will not be for sale. Adding of minor database features. Clicking on an album link will show the list of recordings being sorted by tracks as standard sorting. Re-arrangement of table columns. And four more as ESP-3001 to ESP-3004 in the year 2003. Neither Mr. Yukio Oiwa nor Mr. Isao Oiwa (sons of Yoshihiro Oiwa) could explain the reason of those five CDs being published under a different numbering scheme. 14. Fumando espero - Orquesta Héctor Varela con Argentino Ledesma - 2:41 - ???? - Tango - Artist and recording date unverified. 40 seconds shorter than 1955 version.